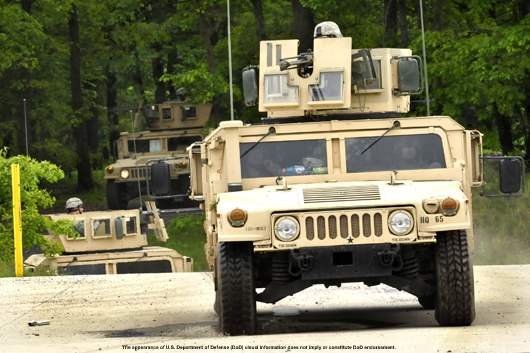 Following a highly successful pilot program – conducted in collaboration with the Michigan National Guard and U.S. Army – involving the field testing of a number of vehicles fitted with a Ricardo engineered antilock braking (ABS) and electronic stability control (ESC) system, the ‘HMMWV Rollover Mitigation program’ has become a priority for the United States Congress. The High Mobility Multipurpose Wheeled Vehicle (HMMWV) or ‘Humvee’, is a core element of the U.S. Army’s vehicle fleet and one that is planned to remain in service well beyond the next decade. In order to improve the safety, serviceability and agility of this important military vehicle, Ricardo embarked on a project in 2014 to modify a fleet of ten HMMWVs belonging to the Michigan National Guard, with a Ricardo engineered ABS and ESC system that would significantly improve occupant safety. The Ricardo system was developed, in part, in response to a National Highway Traffic Safety Administration (NHTSA) report conducted in 2014 that discovered a 74 percent reduction in vehicle rollover since the 2011 mandate of ABS and ESC systems on all passenger vehicles in the U.S. The Ricardo system is the first of its kind to uniquely adapt the same commercial automotive components cited in the NHSTA report to improve HMMWV handling and vehicle stability at a low cost. Moreover, the system also provides shorter stopping distances, significant reduction in the wear of brake system components, and increased reliability and hence operational readiness. Congress’ inclusion of the ‘HMMWV Rollover Mitigation program’ as a priority in the forthcoming defense budget validates the important contribution to vehicle safety that this Ricardo engineered system offers. The complete package developed and tested by Ricardo for the HMMWV includes antilock braking, electronic stability control, active rollover protection, traction control, and improved brake calipers, pads and rotors. The entire system leverages low-cost, proven components Ricardo engineered specifically for the arduous requirements of application in the military environment, and was designed for ease of upgrade to the existing fleet.